"little girls LOVE to play dress up in their moms' clothes, and discover in themselves the images of their mothers." A little girl is celebrating her seventh birthday. And obviously, there is a party for which Mama is planning to wear a sari. The little girl has to help her mother decide which sari to wear for the party. When Mama flips open the suitcase filled with saris that she wears only for special occasions, the girl's excitement to wear one on herself naturally increases. They talk about the different occasions Mama wore each of her saris - a black chiffon one "that shimmers like the night-time sky" she wore for Devi Masi's annniversary; the magenta one with "a herd of galloping deer embroidered on it" is the one she wore when Nanima came to visit the first time. And so on and so forth....Finally, the little girl picks an orange one that Mama tells her she wore when the little girl was first brought home from the hospital. She watches her mama elegantly tie the sari, and "weave the fabric into an accordion between her slim fingers." Seeing her mother shimmer in a beautiful sari, the girl naturally feels ready to look all grown-up and beautiful like Mama. She explains to her Mama she wants to pick a sari for herself because she is a big girl who can "pour her own glass of milk in the morning without spilling and also, does not need the nightlight anymore." Finally, Mama agrees to grant her wish only because it's her birthday. So Mama ties a beautiful, blue sari with gold flowers on her little girl by wrapping the fabric around her again and again. She also gives her bangles to match, and then puts a beautiful glittery bindi in the middle of her forehead! And then asks, "So, what do you think? ", and the girl answers with a sparkle in her eye, "I think I look like you!" I love books like this one where the text and the illustrations enhance each other so much that you can actually feel the textures, and fabrics of the different saris that the little daughter admires in her mother's collection. In fact, wouldn't be an exaggeration to describe that the text and the illustrations flow together just as beautifully as the pleats and folds of an elegantly clad sari. 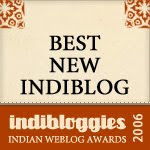 I loved the part in which the author so beautifully describes the little girl's fond memories of her nanima's saris - "the folds and nooks of nanima's saris holding lots of secrets; safety pins and coins fastened on the inside; the smell of cardamom and sandalwood soap all over." That was a neat treat! Additional Resources for Mama's Saris: There's a teacher's guide available on the author's website. A great resource to discuss some of the things that the book highlights. The guide has discussion questions, and project ideas. Pooja Makhijani's Mama's Saris offers a culturally appropriate children's book celebrating one of India's richest traditions. 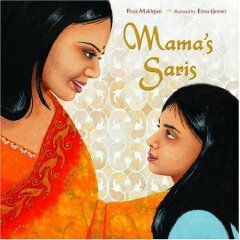 Mama's Sari is a multi-cultural and a multi-sensory treat!" Wow Praba....what an enchangting pick that was. I have only the kurta descendants at home, but I can sooo relate from the POV of the daughter. Wow. Evokes such sweet memories. And the ST page has really livened up from that cover picture you posted. Its beautiful! Praba, thank you for your thoughtful review. I am speechless; you are too kind. Tharini, thank YOU for your kind words. thrilled to see your comment on ST! Thanks so much. What an amazing book, and what attention to details both in text and illustrations! Kudos to you and Elena Gomez! The Saffron Tree Team wishes you the very best with Mama's Saris. Wow !! Thanks for the reco Praba. Am definitely going to check this book out. It is difficult not to - not after having seen the beautiful cover page and such a wonderful review. This is like some Synchronicity going around in the Universe - i was just debating getting this book and writing a review on ST!! nice work on the review. My daughter just turned 5 and got Mama's saris as a birthday present. We read the delightful book tonight. The illustrations and colors are stunning. My own saris are all in a suitcase below the bed and my daughter is always fascinated by their colors! I am sure we will be reading the book many more times.